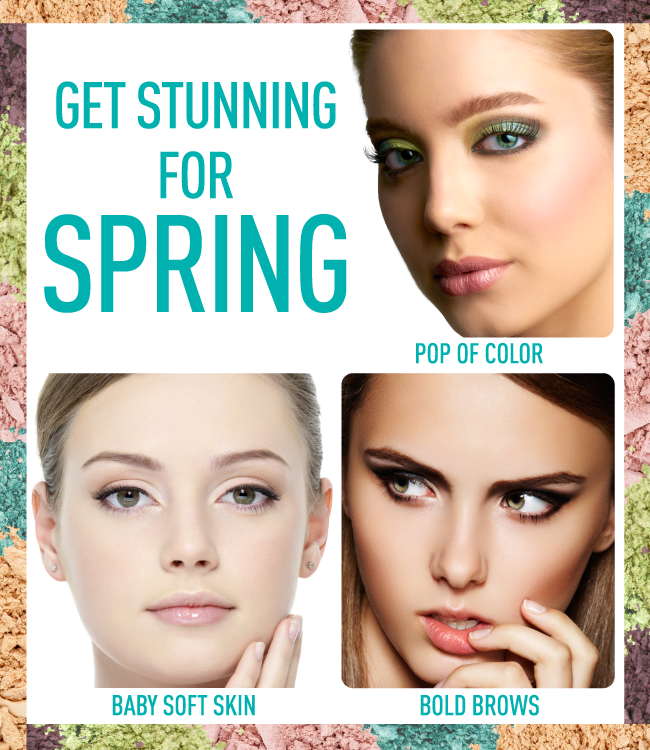 Spring is in the air and we are more than excited about the upcoming beauty trends for the warm seasons ahead. Here we’ve highlighted a few of our favorites! Pops of color! - An easy way to warm up to spring is by adding color! Purples, greens and blues will make eyes pop and create intensity. Whether you go with shades that are bold and bright or opt for pretty pastels, eye shadow makes for a simple way to stay stylish for spring. Check out the variety of beautiful colors in the FLARE Palette! Bold brows - Defined and bold eyebrows ruled the spring runway shows. To get the look, fill in your brows with a brow powder 1-2 shades darker than your natural hair. Use light strokes with a small angled brush until the desired definition, color intensity, and shape is achieved. Silky soft skin - Say goodbye to dull and dry skin from the winter months and reveal your natural radiance for spring! Simply give your face a deep exfoliation followed by an application of a hydrating moisturizer. Use the medium brush head of the Cleansing and Polishing Tool to get perfectly polished skin and use the Spa Solutions massager attachment when applying moisturizer to enhance absorption of product. What are your favorite beauty trends for spring? Pops of colour for me! The two silicone ones are my favorite, extra soft and the massager! Yes, those are definitely awesome for daily skin care to keep your skin looking its best! Pops of colour are a fun for summer especially teal! pop of color...so perfect for spring.. POP OF COLOR mode on!!! !